Reunion shows are supposed to be exciting and dramatic surrounding The Bachelorette. Biggest problem? The lack of Emily Maynard on the stage, she and Chris Harrison reflected on the experience ahead of time. Ryan likes trophy wives, Kalon is a tool and Dougie had a terribly awkward kiss. Emily looking gorgeous at the MTA. Putting Shelly to bed was amazing, then they went on to sing Twinkle, Twinkle Little Star. Little Ricki opts for a story, but not baby egg Shelly. I absolutely loved his rendition of Shakespeare. Arie and Emily kiss at the end of the hometown, then we see younger Arie twins spying on their kisses. Who could blame them? I would spy on them kissing too, their Showtime must have been out. Chris is a terrible dancer, something he should have learned for Toddler’s and Tiara’s. The umbrella falling and Emily saying “Andrew.” Who is Andrew? That was absolutely hilarious. The lights going out during her interview about Ryan. Boos for Kalon, cheers for everyone else, but you would have thought Sean was the Super Bowl Champion. We reflect on Kalon, his feud with Stevie, Dougie and more. How could anyone forget Chris and Doug’s little tiff? I was thrilled when we got to see Arie’s Hulk impression again. I forgot how excited the guys were when Ryan was sent home. Emily, looking hot in pink, and taking down Kalon, with sass and class. 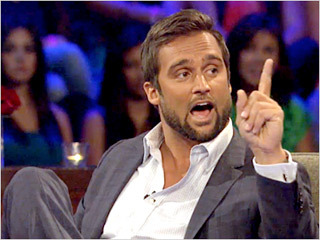 Chris Harrison, always. Considering Jake Pavelka a puppet. Chris, in the fact he still wasn’t over things. 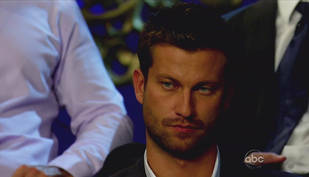 Seriously he just hooked up with how many girls on Bachelor Pad, and is still upset? Kalon and the baggage comment. Why did he tweet something about baggage the other day? Alessandro, why was the cousin, vampire gypsy thing not brought up? Tony giving Emily a hug, sit down boy. What part of him thought that was a good idea? 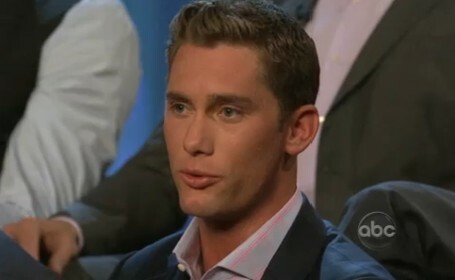 I’m actually quite thrilled Kalon is on Bachelor Pad, seriously he was born for this show. Anyone who is mad about it, will be over it and watching on July 23rd. I'm going to let you finish. Three hook-ups later and all I got was this frown. It made me sad when he was talking about how he lost friends. This is my Bachelor face. I can’t say no about anything when it comes to Sean. He is All-American, has a great family and ladies are lined up around the street for him. He had an admirable exit and it was sad to watch his departure again. How has Sean avoided a Texas takeover by all of the women who like him? He must have retreated to Kensington’s Cottage. His mom said this would be healthy for him in the long run, Momma Lowe was thinking Sean would be the next Bachelor, like I was. Sean hopes the love of his life comes around sooner than later, next Bachelor anyone? Plus Sean was the only person’s name she said, when she was talking about how it was good to see the guys. “What girl wouldn’t want to be with Sean?” I agree with Emily. They have such a strong connection, oh my the way he kisses her is beyond insane. I like he also considers her his best friend, now that a good friend. I loved seeing Emily’s cat videos. I’m sure whoever she picks will love her and her videos. Who do you think she will choose? I can’t wait for the finale! I just spent wayy too much time and going back and reading all your posts from this season, ben's season and Bachelor Pad 2. hahaha I love your writing style! Surprised no one ever comments on the blog! I definitely found Ryan super entertaining! And it really showed that he was not taking the whole process very seriously once he was gone. Its refreshing that he could just laugh at himself. I'm rooting for Arie! I just love his personality and think he is gorgeous! Anyways, great post!! Cant wait to read more! Thank you so much! I'm glad you love it! Do you have Twitter?